A slow-er pace of life / Tails from the undergrowth. Whichever you prefer! While many an eye is kept on the bird and marine life on Skomer some beady eyes are also kept on the islands smaller inhabitants. Throughout the spring and summer reptile and amphibian surveys have been carried out following a transect covering varied habitats around the farm buildings and into North Valley. 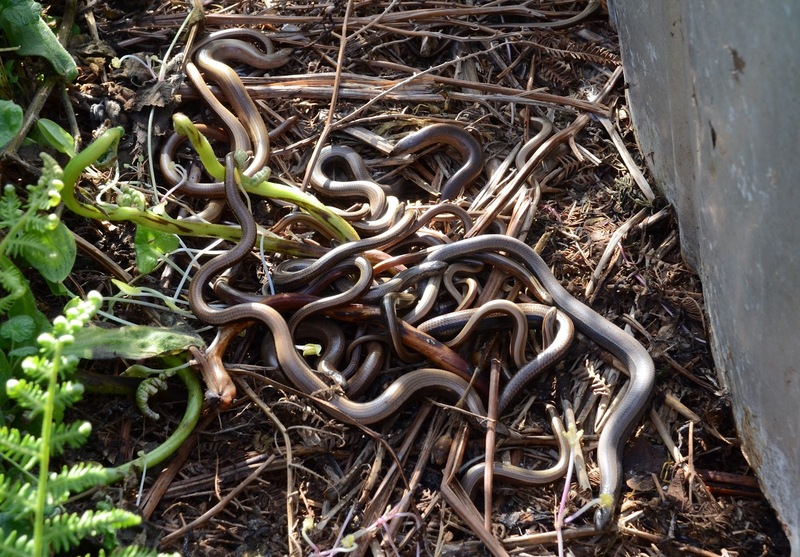 Data on reptiles and amphibians are collected each year by the National Amphibian and Reptile Recording Scheme (NARRS) and results of surveys on Skomer both contribute to this data and help give us a picture of the populations of these species on the island. 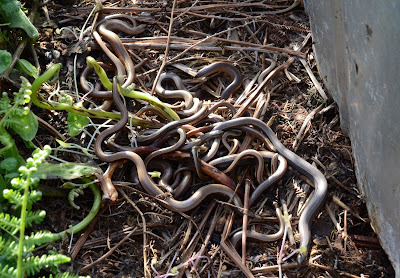 Slow worms (Anguis fragilis) congregate under mats, tins and refugia to maintain body temperature. Uniform greyish brown males, like the one pictured, are outnumbered by brown females that are identified by dark sides and a thin line along their backs. 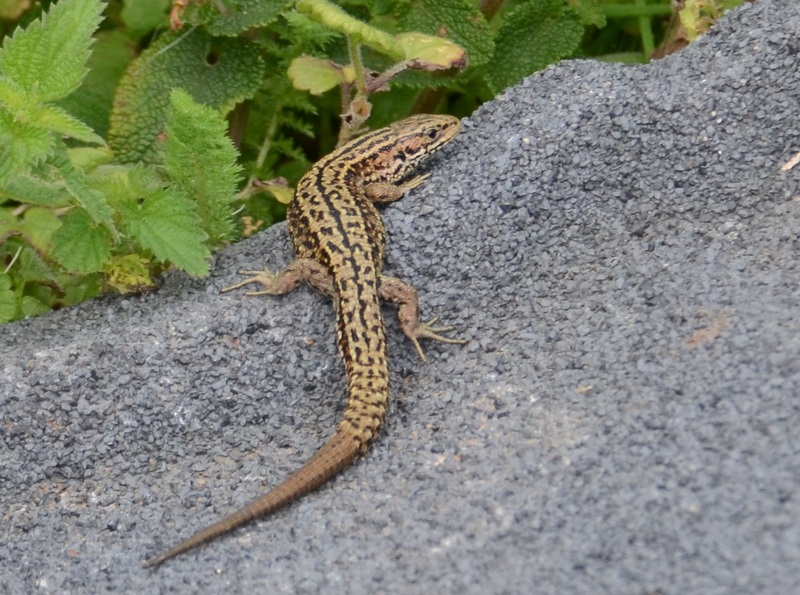 Juveniles are a distinctive gold or silver colouration, with dark sides and a dark stripe running down their body. 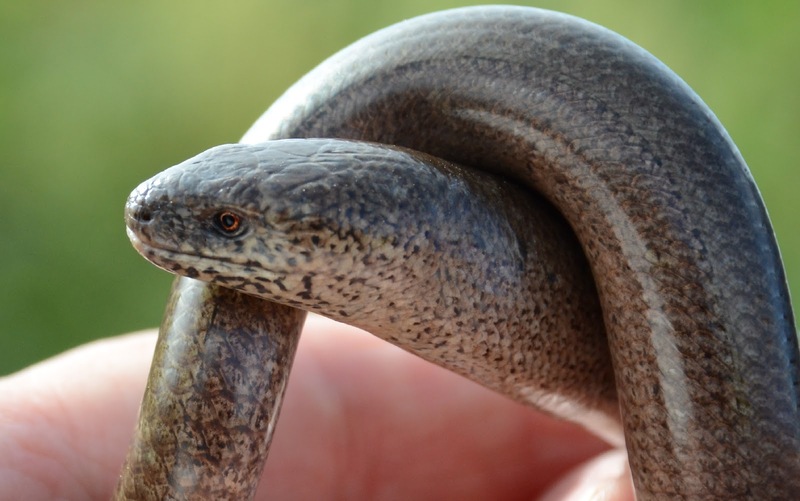 These legless lizards, often mistaken for snakes, lose their tails as a defence mechanism hence their Latin name meaning ‘fragile snake’. Common Lizards (Zootoca vivpara) are often found basking on top of the refugia as well as on dry stone walls around North Valley crossing and Moorey Mere. Males have spotted backs whereas the spots on the females back are joined together to form a line. 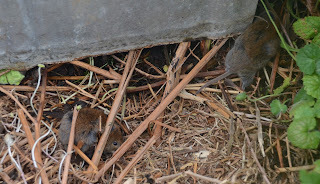 The juveniles are small and blackish brown. There is also a black (melanistic) lizard that often basks near the farm buildings. Common Toads (Bufo bufo) pile up under the refugia and later in the season some sites became busy with tiny toadlets! 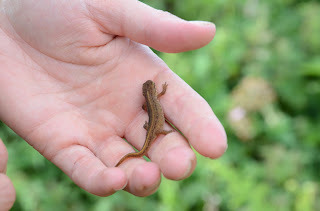 A single female palmate newt (Lissotriton helveticus), also known as the common newt, was found under one of the tins around the farm. Palmate newts are able to withstand drier conditions and venture further from water than other newts. 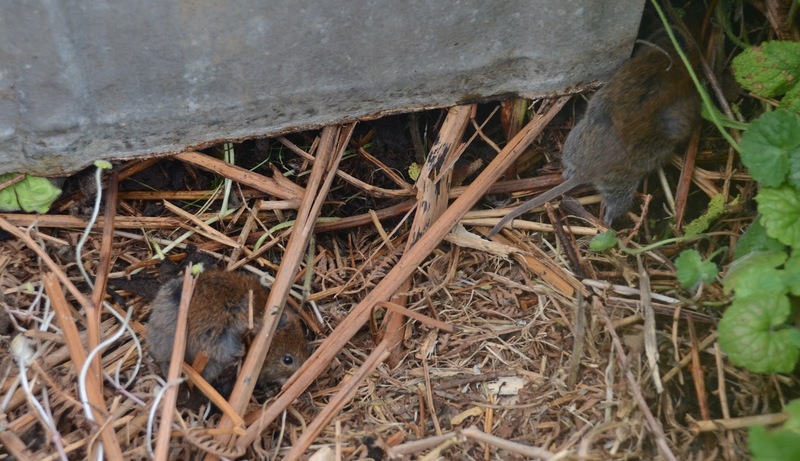 The islands endemic Skomer voles, subspecies of the bank vole, also make the most of the refugia, some making nests under them in well vegetated areas. A record number of 5 were found under one tin. Thanks to all the volunteers that helped out with the surveys this season and a special thank you to Jenni Hood for all the photos! Ali Quinney (Skomer Long term volunteer).